Coquelicot Cottage is situated down a quiet country lane and is tucked away in its own corner of our 2 acre garden. This French home is filled with charm and wonder. It has exposed beams throughout and an old bread oven, which shows off its originality. You firstly step into the sun lounge where you can relax & enjoy the uninterrupted countryside views around you. As you enter the cottage, there is a fully equipped, modernised kitchen with fridge freezer, dishwasher & oven. There is a modern bathroom with a shower. Upstairs is a charming double bedroom with exposed beams with lots of light and character. You have stunning views of the surrounding garden and fields from your window. You won't want to get out of bed in the morning! The outside area overlooks fields beyond our garden. There's a patio set and BBQ so you can sit and relax, especially at the end of the day when you've been out exploring. The added bonus is our pool that you are welcome to use so you can relax and cool down. (The granary style stairs are fairly steep and would not be suitable for people with mobility problems). There is open countryside all around, which means there is always lots of wildlife to hear and see. The summer brings such a great range of butterflies, birds and dragonflies to the garden. We are a short drive away from the Loire River and its many stunning towns and villages, such as Saumur, Chinon, Bourgeuil, Montsoreau, Villandry, Chenonceau, Amboisem, Fontevraud Abbey - to name but a few - what an ideal location to explore one of the prettiest and most stunning parts of the world. We have 2 charming holiday rental cottages for you to enjoy, each having their own individual charm and private space to relax. Our Fleur de Lys cottage has 2 bedrooms and can sleep up to 4 people (Owners Direct ref 8165976). Our Coquelicot Cottage has one bedroom and sleeps 2 people. We would be delighted if your party of 6 would like to visit at a reduced rate. Each cottage has been lovingly restored to a high standard that combines both character and comfort - we are confident that you will leave feeling relaxed and recharged. There are so many villages and country lanes to explore - either on foot or by bicycle or by car. We are close to La Flèche, Baugé, Saumur, Angers, Le Mans. Don't forget the Le Mans 24 hour race in June and the Classic 24 hour in July. The Tour de France often passes nearby in July. The Classic Grand Prix car race in Puy De Notre Dame is a great spectacular also late July. The vines are ripe for harvest some time late Sep/early Oct. If you like wine, you're in for a treat. All the vineyards will have free tastings (dégustations) so you can meet the owners, try before you buy and then bring your purchase back to enjoy back at your cottage. There is a wide choice if rosés, whites, reds and especially sparkling - we can point you in the right direction, especially for guided tours that show you the wine making process. You are welcome to use my own washing machine for €3 per load. Modernised kitchen with full self-catering facilities home from home. 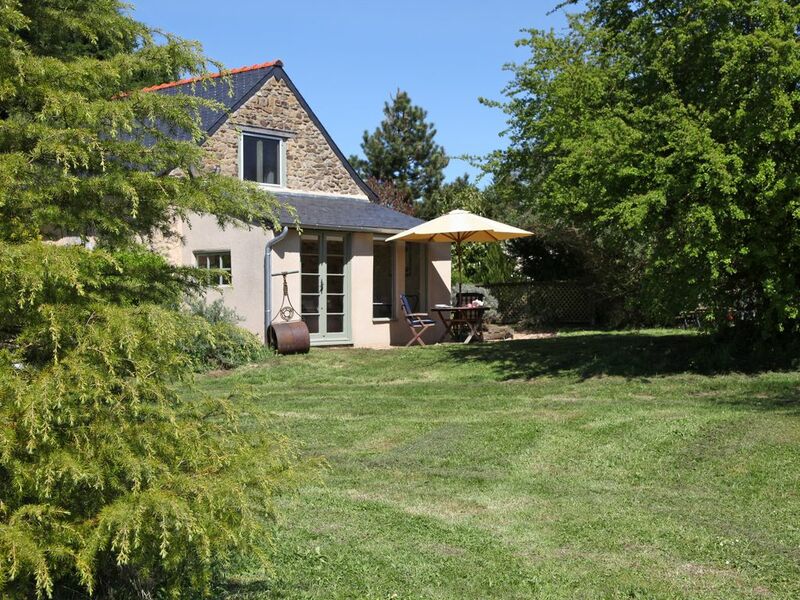 This is the perfect location for a quiet holiday in the country but also for visiting the cities of Le Mans, Angers and Saumur and indeed the wider Loire area. The cottage is lovely, charming and well equipped and surrounded by an incredible, butterfly friendly garden with beautiful countryside beyond. We were here for a fortnight and it enabled us to combine our sight-seeing with time to relax and unwind. Carol and Carl are lovely people and excellent hosts who gave us some superb advice on attractions to visit, the most scenic routes and, of course, the best restaurants. We already know that you had a great time staying in Coquelicot Cottage. Like you say, you had 2 full weeks of sight seeing, relaxing, dining out and of course, taking so many great photos of all the wildlife in our garden. Don’t forget to send us a calendar! Thanks for choosing us and we look forward to welcoming you both again one day soon. Had a wonderful stay here and Carol and Karl couldn’t have been more welcoming. Our little gite was a perfect base to tour the Loire Valley and go to the racing at Le Mans. Everything we needed for a perfect holiday in France. Thank you both very much. We look forward to returning in the future. Thank you for your kind review and for choosing to stay at Coquelicot during your visit to classic Le Mans this year. We are glad you were able to return to your peaceful ‘haven’ after visiting Le Mans, and enjoy the peaceful countryside. We look forward to welcoming you here again soon. It was a pleasure to welcome you to our gite. We are delighted that you enjoyed our little corner of France and our hospitality. We enjoyed getting to know you too. We’re very excited that youre planning to come back next year. Thank you for choosing us. Excellent location in the quiet countryside. Wonderful welcome from Carol and Carl to this quiet cottage in the countryside of the Loire Valley. The cottage itself was ideal for our needs as a couple with outside space to relax and enjoy the tranquillity. The location of the cottage was ideal for travelling around and Carol and Carl had plenty of ideas and suggestions for trips, visits and walks. We did day trips to Saumur, Villandry Chateau, Le Mans and Angers. Nearby towns of La Fleche and Bourge were ideal for supplies of groceries and petrol. We also walked around the almost traffic-free country lanes near the cottage. We wouldn't hesitate to go back and stay at this cottage again. Thank you for your kind review. We certainly enjoyed having you to stay at Coquelicot Cottage and you left the cottage immaculate - thank you. We know you were able to relax in the cottage and garden and enjoy the peace and quiet, listening to the birds, watching the wildlife and of course, the cows in the fields. You also explored the area and found some nice countryside walks directly from your cottage. You also got to see some of the major tourist attractions in between too. You were both lovely, kind and friendly guests and we can't wait to welcome you here again one day in the future. Coquelicot Cottage was just what we needed. Beautifully restored, clean and well maintained whilst keeping the history of the building. Carol and Carl were (are) the perfect hosts - warm and friendly, yet respectful, and had good suggestions of what to see and do. We miss sitting outside and reading in the sunshine! And having a refreshing dip in the pool. And the cows in the field. So peaceful. Would not hesitate to recommend the cottage - perfect for a couple. Thank you for your review. We're very glad that you enjoyed your 2 week stay in Coquelicot Cottage. You certainly made the most of exploring the area as well as relaxing in the garden. It was nice to see you enjoying the garden and pool and for us to hear about your days' travels and visits. Thanks for choosing us and we hope to welcome you again one day spon. Spacious kitchen, light living room, modern bathroom and a big undisturbed garden with a fine view over the fields and the forrest. The host and hostess are kind, helpful, well informed about the area and discreete. We spent two weeks in this cottage and we had a very succesful holiday. The standard is such that it is really good value. To be recommended! Thank you for your kind review. We already knew that you really liked the cottage and garden, as you often told us. You managed to see lots of the nearby attractions as well as explore the surrounding area on your bikes. You were lovely guests and we are very pleased that you made the trip all the way from Denmark to 'notre petit coin' of France. We hope to see you again. As Coquelicot is set in beautiful, rural countryside, this is a wonderful location for relaxing, painting, reading, walking, running, cycling, canoes, kayaks, fishing, wine tasting, and lots of sightseeing. Close to Baugé, La Fleche, Saumur, Le Mans - all within easy reach by car. We are approx 2 hours from the coast, but very close to the Loire and Lori rivers. Here you can enjoy walking, cycling, kayaking and having picnics. During the summer when the river is low, there are sandy beach areas where you can swim and sunbath. There is La Monnerie, a beautiful beach by a lake in La Fleche. In the summer, you can enjoy swimming and sunbathing by the waters edge. There is also an indoor leisure centre with swimming pools and exercise facilities.